I just registered for 2019 Ride For Roswell. Wow, how time flies by. I will be retired on January 23 2019. This year is a special one as I will be 50 years CANCER FREE. I can't begin to tell you how lucky I feel being able to do this ride, retired and alive. The older I get the more grateful I am to being able to still participate in this wonderful fundraiser to help cancer research. We need to find ways to cure and treat this ugly disease. 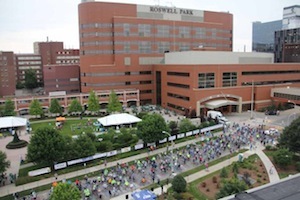 This ride supports cutting-edge research and compassionate, innovate patient care programs at Roswell Park Cancer Institute. The ride is an exciting fundraiser but also a very emotional day for me. As I ride I thank GOD for all survivors that we have and I think of them, my dear friend, Linda, my niece Jackie, cousins Laurie, Cheryl, Julie, David, Tom and so many more that there are too many to name. I also ride in memory of so many others that lost their battle to cancer including my coworker, Roberta Wicinski, my sister in law, Kathy, my dear cousins, Ginny, Brian, Kathy,dear friend, Eddie, and so many more that I know if I tried to mention all of them I would miss a few. I have so many good memories of all of them. Together we can help find cancer cures and save lives. I hope you can continue to support me anyway you can!!! No amount is to small! I thank you from the bottom of my heart!!! My goal is to raise $1,000 to continue to stay in the Extra Mile Club!!! !